Short Sales Go Pending But Fail to Close- WHY? Short Sales in El Dorado Hills are being accepted and approved by the banks and going into pending status far more frequently than ever before. 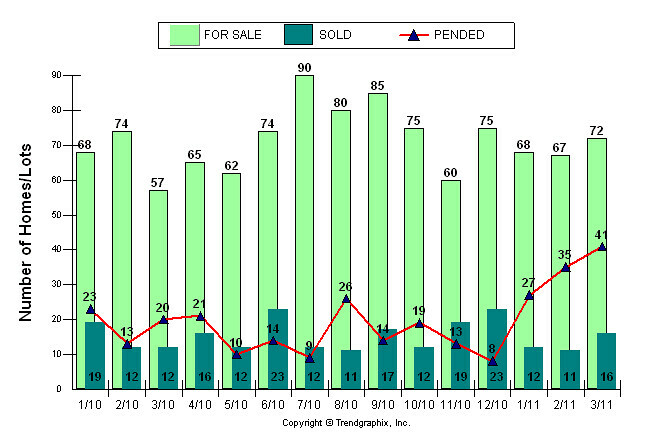 However, as the graph above show, Short Sales in El Dorado Hills are definitely not closing any more frequently. How is this happening? What could be the problem? I know that many short sale escrows definitely fail because of issues with the property. Buyer inspections are done after the bank approves the short sale and the home goes in pending status (the red line on the graph above) but when there are repairs that are requested or issues that require work to be done or a price adjustment, the escrow fails and the home typically goes back on the market. When the bank and buyer finally settle on a price, the entire short sale transaction revolves upon the bank or investor receiving a specific amount, reflected on the NET SHEET. If the short sale buyers want repairs done by the seller (who almost always has no money to do repairs) or the bank (who have already approved the NET SHEET) the deal is typically dead. You see, a lender doing a short sale approves a transaction based upon the NET. In a short sale package sent to a lender, perhaps the most important element is the NET SHEET or HUD, this is the document the investor (entity that actually owns your note) looks at and compares against current appraisals and broker price opinions in order to decide whether to take the short sale offer or send a counter offer to the short sale agent to be presented to the buyer through the buyers’ agent. The other major reason short sale escrows fail is because short sale buyers, knowing that only a fraction of short sales are ever approved, are writing offers on several properties, even though they can only buy one. So a short sale buyer may be in escrow on a house they don’t really want that bad, and if another home pops up on the market that meets their needs better, they bail. Add to this the fact the market in El Dorado Hills is still falling. Short sale approval prices, after months of negotiations, are very commonly at over market value by the time they are approved. Buyers look around, find other properties cheaper and either ask for a price reduction (which means the short sale approval process must start all over, and the home technically should no longer be in pending, although many times it stays there) and the short sale approval process must start all over. This entry was posted on Saturday, April 9th, 2011 at 7:55 am	and is filed under Avoid Foreclosure in Sacramento, Sacramento Area Short Sale News. You can follow any responses to this entry through the RSS 2.0 feed. Both comments and pings are currently closed.